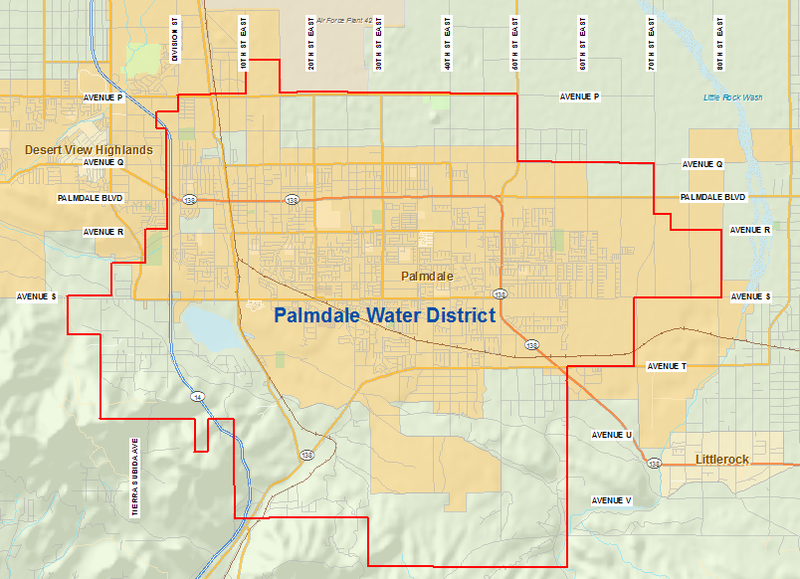 Residents who live within the boundaries of the Palmdale Water District receive their water from one of three sources or a combination of these three sources. Most Californians are familiar with the State Water Project (or the California Aqueduct). This surface water water source begins in Northern California at Orville Reservoir with water flowing into the Sacramento River delta and is pumped South to serve the urban and agricultural centers of Southern California. The District is entitled to take 21,300 acre feet, or 5.6 billion gallons, of water each year from the aqueduct into Palmdale Lake where it is stored for eventual use. This water is then treated at the District’s water treatment plant for distribution to the public. Another source of surface water is supplied by the reservoir created by Littlerock Dam. Littlerock Dam was originally built in 1922 and was recently renovated to increase the storage capacity of the reservoir to 3,500 acre feet, or 1.1 billion gallons, of water. Littlerock Dam reservoir is fed by natural run-off from snow packs in the local mountains and from rainfall. The water is then transferred from Littlerock reservoir to Palmdale Lake. After entering Palmdale Lake, this water is treated at the District’s water treatment plant for distribution. More historical information on the Littlerock Dam can be found at the Library of Congress. A third source of water for the District’s customers is through the District’s water wells pumping ground water. A well is drilled, a pump installed, and then the water is pumped from as deep as 550 feet from the earth’s natural underground aquifer. This water is then treated with chlorine and placed into the District’s distribution system. Well water makes up approximately 40% of the District’s annual production. In drought conditions well water production may increase up to 50-60% to offset the lack of available surface water. Leslie O. Carter Water Treatment Plant (LOCWTP) is a conventional potable water treatment plant that utilizes state of the art equipment and processes. It has the capacity to treat 35 million gallons per day. Recent upgrades have improved nearly every phase of the treatment process. The most notable improvement has been the addition of granular activated carbon contactors. These GAC contactors provide Palmdale Water District with the capability to remove a wide range of naturally occuring and man-made contaminants from the water. The recent upgrades and the addition of GAC contactors will help ensure that LOCWTP produces high quality water both now and well into the future.